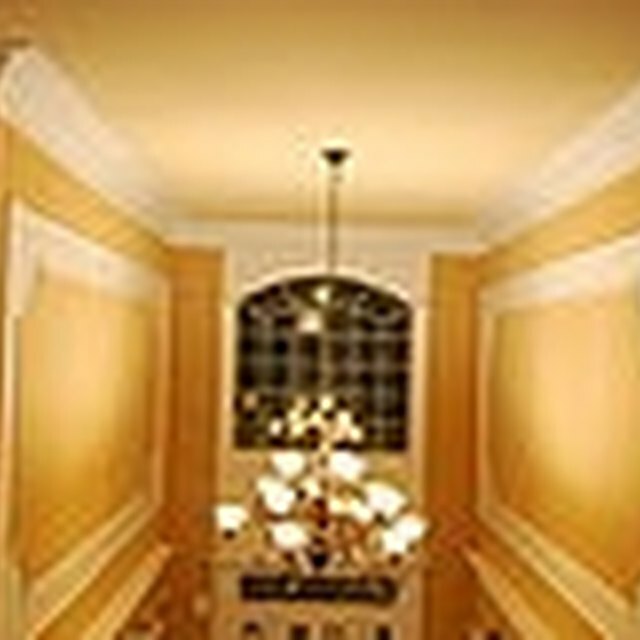 No matter how carefully you measure and cut, sometimes crown molding simply doesn't make a perfect fit in the corner. If you have the ability, you can cope the molding for a more precise fit on inside corners, but outside corners have more limitations. After many attempts at home improvement, most do-it-youselfers eventually realize that successful home improvement is more about what you can hide than what you can perform perfectly. Before you cut hundreds of dollars worth of molding trying to fix a 1/8 inch crack, try repairing the crack instead. Squeeze a line of caulk into the gap between the molding. Make sure you use a stainable/paintable caulk. Wet your finger and smooth the caulk into place. If the caulk sinks into the crack, allow the caulk to harden just a bit, then apply another line of caulk to the crack. Repeat this process as many times as necessary to completely fill the crack with caulk. Allow the caulk to dry completely. Sand the caulk with a small, fine-grit sanding block to make a smooth connection between the two pieces of molding. Your objective is to make the caulk an extension of the molding itself so that the naked eye sees no difference unless scrutinizing the joint. If you have a steady hand and a Dremel or other rotary tool, you can use it to sand the caulk. Wipe the sanding dust from the molding with a soft, dry cloth, and touch up the caulk with the paint or stain you used to finish the molding. Allow the paint or stain to dry completely before applying another coat. If you don't have a sanding block available, a fine fingernail filing block will also work. If you repeatedly run into problems with corner fits for crown molding, consider purchasing a protractor that measures the exact inside and outside angle of any corner. The exact angle measurement will help you make a better selection for settings on your miter saw. Wear safety glasses when sanding the caulk to prevent dust from falling in your eyes.